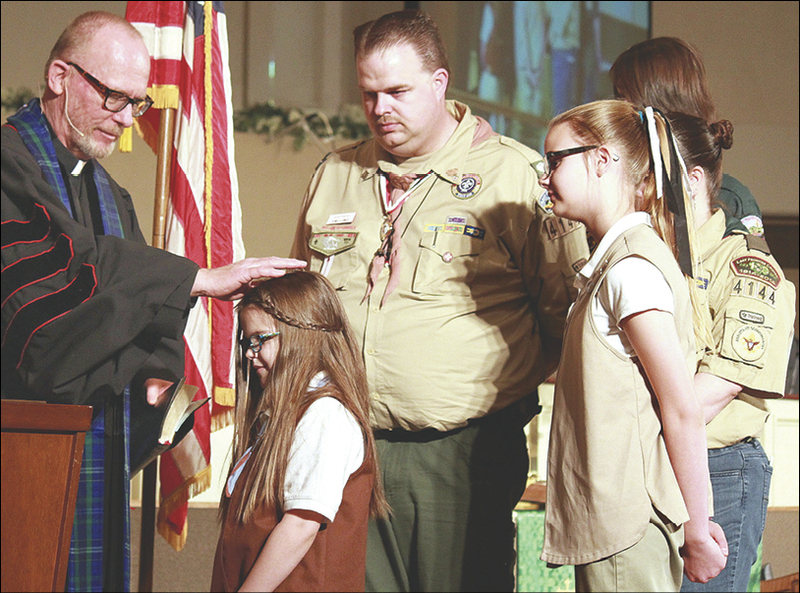 SCOUTING SALUTE — More than 50 boys, girls, and adult leaders from various scouting programs helped lead in all the facets of worship Feb. 12 on Scout Sunday at Lawton-First UMC. The religious award was presented to 27 youths and an adult. Above: Pastor Randy Scraper baptizes Jayme Chapman. Her family includes James, Emily, Richell, and Symon. Top left: Dylan Todd prepares for the flag ceremony. Lower left: Edan McLean and Symon Chapman provide music. 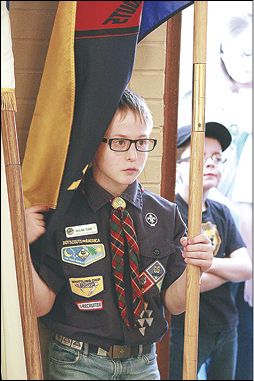 Scouts have been active at Lawton-First since 1934. 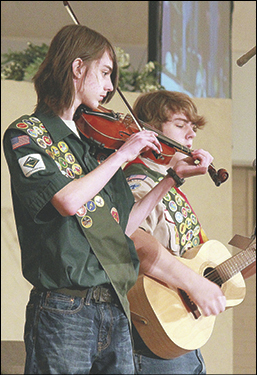 The number of youths involved in Scouting packs, troops, and crews chartered by United Methodist churches is on the rise, reports the General Commission on United Methodist Men. At the end of 2016, the Commission said 327,405 youths were involved in Cub Scout packs, Boy Scout troops, and Venturing crews. That’s a national increase of about 2,700 boys and girls. Sam Welch of Wellston, the Oklahoma Conference’s Youth-Serving Ministries coordinator, was pleased with the news of growth. "Scouting is a great program for churches to sponsor," he said. "It’s a great way to grow your church." The denomination won praise from Michael Surbaugh, chief executive of the Boy Scouts of America, during a January visit to the Commission’s office in Nashville, Tennessee. "The Boy Scouts of America congratulates The United Methodist Church for increasing its service to youth with a membership gain in 2016," Surbaugh said. "This is our first growth in several years," said Larry Coppock, director of scouting ministries for the Commission. In related news, the Commission has recruited 14 pastors for service at the Boy Scouts’ National Jamboree, to be held July 19-28 in West Virginia. Coppock said 12 of them will serve as chaplains. Additionally, 30 volunteers will serve as staff at the "Duty to God and Country" UMC Scouting Ministry exhibit. 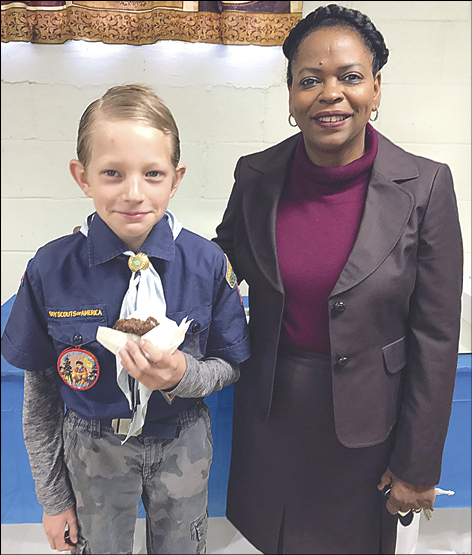 SPECIAL SUNDAY — Nicoma Park United Methodist Church celebrated Scout Sunday on Feb. 11 by honoring Cub Scout Troop 280, which is affiliated with the church. Cub Master Clint Hammond reported the troop has grown from 15 boys to 32! They presented the colors and served as ushers in worship. After the service, breakfast was served to the boys and their families. Pictured is Troop 280 member Andrew Urie with Pastor Nancy McCullough.